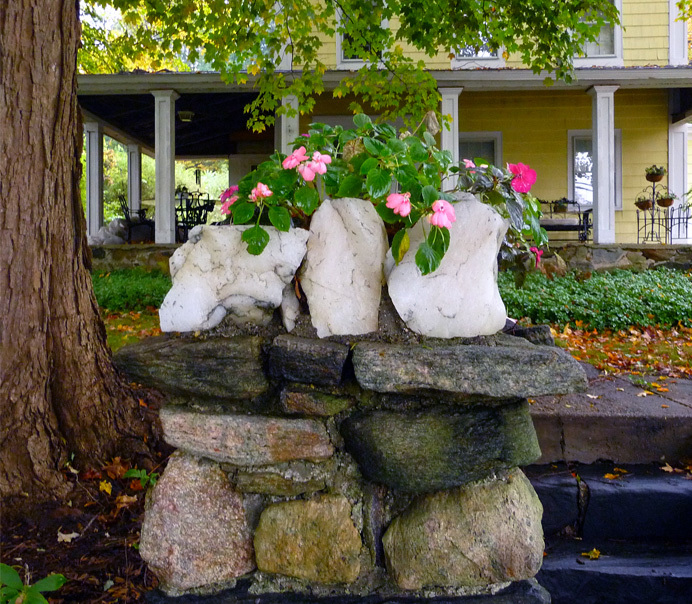 Chunks of calcite decorate a stone fence in front of an 1820s farmhouse on King Street. The owner says that his grandfather, who bought the house in 1917, unearthed the white stones while plowing his fields. Calcite is a strange rock. Transparent when pure, it formed hundreds of millions of years ago from calcium-bearing body parts of marine animals. One major donor was trilobytes, which dominated the seas 540 million to 250 million years ago and are thought to be ancestors of today's horseshoe crabs. The rocks atop this fence are made largely of the lenses in trilobyte eyes. .